16.01.19 06:12;Account;Receive;Received Payment 2.55 USD from account U2836474 to account U1294000. Batch: 242885618. Memo: API Payment. Withdraw to allhyips from allhourspay.com. 15.01.19 18:07;Account;Receive;Received Payment 2.79 USD from account U2836474 to account U1294000. Batch: 242844278. Memo: API Payment. Withdraw to allhyips from allhourspay.com. 15.01.19 07:21;Account;Receive;Received Payment 2.55 USD from account U2836474 to account U1294000. Batch: 242772649. Memo: API Payment. Withdraw to allhyips from allhourspay.com. 14.01.19 17:40;Account;Receive;Received Payment 4.38 USD from account U2836474 to account U1294000. Batch: 242727674. Memo: API Payment. Withdraw to allhyips from allhourspay.com. 18.01.19 06:39;Account;Receive;Received Payment 25.2 USD from account U2836474 to account U1294000. Batch: 243099579. Memo: API Payment. Withdraw to allhyips from allhourspay.com. 18.01.19 00:09;Account;Receive;Received Payment 20.25 USD from account U2836474 to account U1294000. Batch: 243082295. Memo: API Payment. Withdraw to allhyips from allhourspay.com. 17.01.19 06:16;Account;Receive;Received Payment 22.8 USD from account U2836474 to account U1294000. Batch: 242998499. Memo: API Payment. Withdraw to allhyips from allhourspay.com. 20.01.19 05:16;Account;Receive;Received Payment 23.25 USD from account U2836474 to account U1294000. Batch: 243293022. Memo: API Payment. Withdraw to allhyips from allhourspay.com. 19.01.19 17:48;Account;Receive;Received Payment 21.39 USD from account U2836474 to account U1294000. Batch: 243263430. Memo: API Payment. Withdraw to allhyips from allhourspay.com. 19.01.19 05:39;Account;Receive;Received Payment 21.9 USD from account U2836474 to account U1294000. Batch: 243200459. Memo: API Payment. Withdraw to allhyips from allhourspay.com. 18.01.19 18:07;Account;Receive;Received Payment 20.55 USD from account U2836474 to account U1294000. Batch: 243169205. Memo: API Payment. Withdraw to allhyips from allhourspay.com. 22.01.19 03:44;Account;Receive;Received Payment 16.5 USD from account U2836474 to account U1294000. Batch: 243497173. Memo: API Payment. Withdraw to allhyips from allhourspay.com. 21.01.19 17:42;Account;Receive;Received Payment 2.67 USD from account U2836474 to account U1294000. Batch: 243464566. Memo: API Payment. Withdraw to allhyips from allhourspay.com. 21.01.19 08:18;Account;Receive;Received Payment 4.95 USD from account U2836474 to account U1294000. Batch: 243401818. Memo: API Payment. Withdraw to allhyips from allhourspay.com. 20.01.19 17:33;Account;Receive;Received Payment 23.55 USD from account U2836474 to account U1294000. Batch: 243353679. Memo: API Payment. 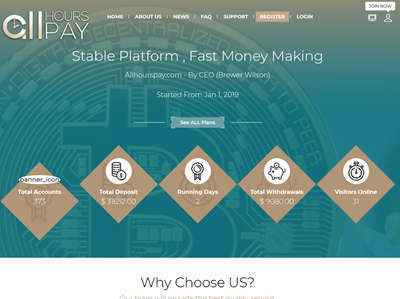 Withdraw to allhyips from allhourspay.com.